To split or cut stone is an essential process in working stone. Splitting stone is generally much more efficient in terms of time and labor, while cutting or sawing allows a much greater degree of control in the finished size and uniformity of the block. 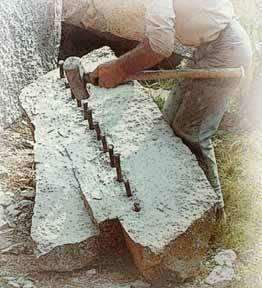 Historically, one of the most common methods of splitting stone has been achieved with either boring a row of holes or carving a trough across the area to be parted, and then wedging the material apart. One method used by various cultures, including ancient Egypt and Rome, drove dry wooden wedges into the trough, and then soaked the wood wedges with water, which subsequently expanded and split the blocks in two. The advent of steam power gave rise to the use of the wire saw in the quarrying of stone. A continuous loop of wire that in some cases could be several miles long, was looped back and forth around the quarry where needed through a series of movable pulley wheels. 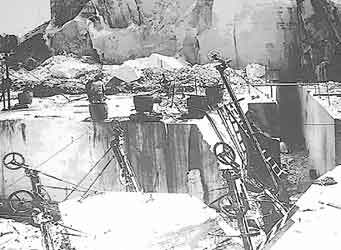 The wire was placed so it would loop over and around the blocks to be quarried, and the area in contact with the stone was fed a continuous slurry of sand and water which resulted in a slow but steady abrasive cutting action. 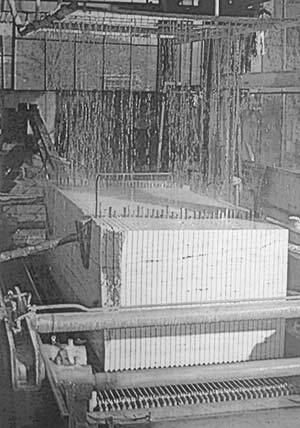 After the blocks are small enough to be transported from the quarry to the mill, the rough-sawn blocks need to be cut into dimensional stone. 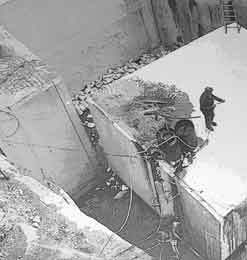 Two views of a quarry showing the Helicoidal Wire Saw in use. The wires are positioned to make the cuts by looping around the strategically-placed pulleys. Abrasive sand in the barrels and water pumped through the hoses is fed onto the moving wire to produce the cutting action. 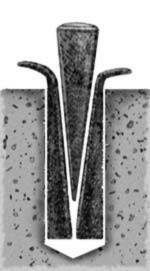 Another method of splitting which is still used today consists of drilling a row of holes in the stone along the line wherein the split is intended. After the holes are bored, two shims or feathers are inserted in each hole, followed by a wedge between them. The wedges are tapped into the hole to put pressure on the shims, thus splitting the stone. 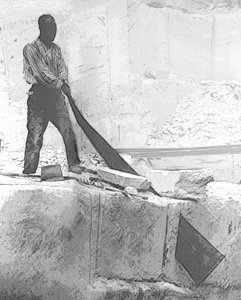 The number and size of the holes plus the size of the wedge-and-shim combinations needed to split a particular block of stone will vary, depending on the characteristic type and grain of the of stone being worked. Generally, I have found that the harder and more uniform stones I work (granite, plain marbles, serpentine) require fewer holes than the softer or more variagated stones ('fancy' marbles, limestone, alabaster, and steatite). 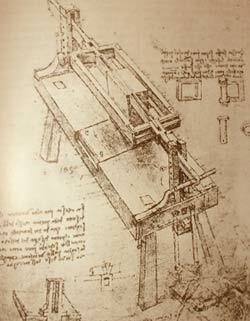 Though in the Renaissance Leonardo da Vinci devised a machine that would allow several slabs to be cut simultaneously by a two-man team, until the industrial revolution the use of the saw in the stone industry was usually on a single-user scale. 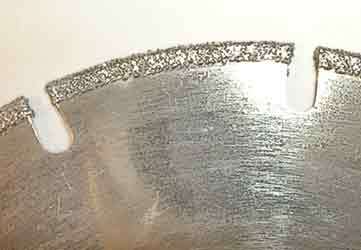 During the last several decades the traditional abrasive-slurry method has been almost completely replaced by more efficient and faster-cutting blades fitted with diamond-embedded teeth. However, the basic water-fed design of the Multi-bladed Gang Saw is almost unchanged, and the time required to saw completely through a large quarry block is measured in hours. 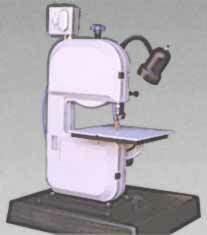 Generally the next type of saw used is a large power-driven saw that is similar in function to Leonardo's design above. 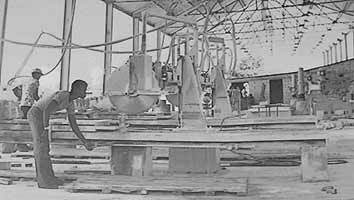 Older versions of this type of saw had steel blades that used the abrasive slurry in much the same manner as the wire saw in the quarry. 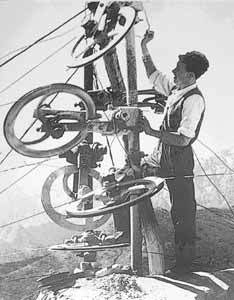 The wire and pulleys being checked by a workman at support junction. the mill . . . The use of the saw to work stone has been circumscribed historically by the relative hardnesses of the material to be cut and the materials available to make the tool. 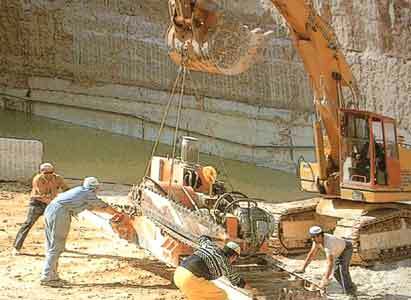 Because of this, the operation of sawing stone was limited to cutting either very soft stone, or to cutting relatively small blocks of stone. 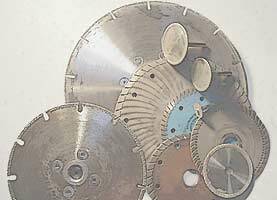 Though the Circular Saw blade was first fitted with diamond teeth back in the 19th century by Henry Disston & Sons, it is still the most used type of saw for cutting stone slabs. 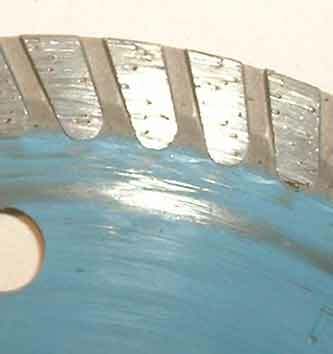 Large versions are all designed to be used with a constant water-feed, but in the last thirty years smaller 'dry-cutting' blades have become common for the individual user. 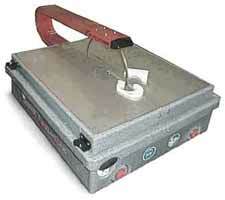 A typical water-fed Diamond Band Saw for cutting thin slabs and sheet glass, the reservoir for the recirculating water at the base. 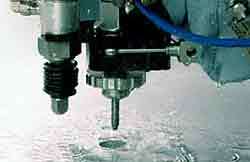 Computer assisted technology has also made possible the precision cutting of marble, granite and other hard materials through water-jet cutting. Water-jet cutting uses a precise stream of high-pressure water pumped at three times the speed of sound to feed abrasive particles to cleanly and efficiently cut through several inches of material with tolerances measured in thousandths-of-an-inch.